Finally, the announcement I've been waiting for. Smokejumper made this announcement on the EQ2 forums yesterday. We've solved some technical issues recently and we can now offer character slots for sale. (Something previously unavailable.) So as of October 5th (Tuesday), character slots will be available for purchase in the marketplace. Slots are pemanent. You pay for them once and they stay on your account forever. You can purchase any number of character slots. There is no limit. You want 20, 30 or even a bajillion character slots? Go for it. If you cancel your SA subscription, and then buy slots to replace the slots you were getting, your characters *will* still be present in those purchased slots (they won't get deleted during the swapover). Character slots will be available in the in-game marketplace for 1000 SC each. Only having seven slots available to me with a regular account was one of the main reasons I haven't returned to EQ2. Once I started playing Eve Online, I just couldn't justify paying for a Station Access account for just two additional character slots. But now? I can just pay for two extra slots and I'll have all 9 of my characters available to me. And if I really want to get crazy, I can dual-box because paying for two accounts will actually be cheaper than paying for one Station Access account, even accounting for the extra copy of EQ2 I'll have to purchase. Of course, I do have a new current fantasy game love (not WoW), so I won't be rushing out to get Sentinel's Fate right away. In fact, I'll probably wait until the next expansion that comes out in February. But still ... all I can say is, "It's about time, SOE!" I set up the Khumaak Flying Circus as a tax haven for when Rosewalker left Thukk U. But I decided that I would have some fun and try to develop the corporation a bit. As part of that I came up with the description below that displays in-game. The Khumaak Flying Circus in named in honor of Drupar Maak, the slave who killed Arkon Ardishapur, the royal heir to the Ardishapur family, on Starkman Prime and began the great slave rebellion that eventually led to the formation of the Minmatar Republic. Drupar, who served as Arkon’s personal secretary, killed the Amarrian royal heir with his own ceremonial scepter, called a Khuumak, when Arkon was on the verge of discovering that Drupar was a ringleader of a planned revolt. In honor of Drupar, the slaves began arming themselves with imitation khuumaks, calling them khumaaks. It is the makeshift weapon of the slaves, not the sacred symbol of their Amarrian masters, which the corporation is named after. Another reason for honoring Drupar Maak is that the Vherokior tribe is an offshoot of the Starkmanir tribe. Arkon’s successor Idonis ordered the extermination of the Starkmanir in retribution for his father’s death, but a few years ago New Eden learned he had failed. The name “Khumaak” is a reminder of when the Starkmanir led the revolt and not what our cousins turned into during their escape from the Ardishapur family’s vengeance. Currently the Khumaak Flying Circus is establishing relationships in the Metropolis region and can offer perfect refining of scrap metal as well as minerals found in high security Empire space to members in the more advanced Core Complexion stations. I don't know how inviting this description is, but I did get someone who wanted to join in the day after I posted it. On Thursday, 30 September, CCP will implement patch 1.1 of Eve Online's Tyrannis expansion. The outage is planned for 11:00 GMT to 13:45 GMT, but, as always, plan for a longer downtime. In other words, take a look at your training queue and plan accordingly. The backend of the EVE User Interface has been refactored to allow for faster development and ease of programming. Because of this some UI settings, such as stacked windows, may not be preserved after the patching process. Cluster memory usage for the Planetary Interaction feature has been on the increase since the launch of Tyrannis earlier this year. A number of optimizations have been included to ensure the feature’s memory footprint remains a dainty flutter for years to come and for the betterment of Tranquility’s health. Planetary Interaction gameplay remains unchanged. The ammo-icon no longer overlaps with the ammo-counter when you assume control of a POS gun. Resolved a crash issue related to rapidly switching between planets in planetary mode. The mailer cache error preventing EVE mail working in the Mac client will no longer happen. Fixed an issue with font rendering in the in-game browser. Some graphics glitches on ATI cards have been fixed, notably the effects when the shader setting is set to high and the rendering of ship afterburners. Users applying skill points directly to a skill would, in rare cases, show that two points were needed for next level when in fact only one point was needed. This helpful calculation has now been made more accurate. Resolved zoom issues when viewing a planet in planet mode while the resolution aspect ratio is higher than 1.6. I go overseas for a week and CCP picks that week to start announcing their expansion schedule for Eve Online. On Tuesday CCP announced the November expansion, Incursion. While CCP Greyscale released details about the Noctis in a dev blog two weeks ago, I'm really looking forward to seeing the details of the Sansha Mothership. The other news was an actual date for publishing Incarna, the long-awaited "walking in stations". On Thursday, Eurogamer obtained an exclusive interview with Eve Online creative director Torfi Frans Olafsson and revealed that Incarna will be released in the summer of 2011. Walking in Stations, as Incarna was then known, was promised on and off throughout 2009. As the name suggests, the expansion/addition allows avatars to walk and explore 3D environments; where no [EVE] man has gone before. In closing, Olafsson reiterated that Incarna's release next summer will be a beginning rather than an end: "This will not be a full-blown new game inside EVE with 10,000 hours of content," he said. However, his overarching aim with Incarna will be to change the face of EVE Online forever. "Incarna is not really an expansion, it's an addition to the game which is a stepping-stone in us realising our long-term goal of making EVE the ultimate science fiction simulator," offered Olafsson. "Essentially, it's the transition from EVE being 'the space game' to EVE becoming 'the ultimate sci-fi world'." As part of the preparation for Incarna, part of the Incursion expansion will allow players to rework the appearance of their characters. Sometimes I hear music while listening to Eve Radio and wonder where it came from. I finally found one of those songs through a link at Fiddler's Edge. Now, I'm not sure about how good the music really is because if it's not country, I'm not a good judge. But I like the lyrics, and hey, any video that has Stan Lee in it can't be bad, right? Sofia, BG - Whenever a big scam like Titans4U occurs, Eve players will point out that CCP does not convert ISK, the in-game currency of New Eden, into real life money. Well, that is true most of the time. On Wednesday CCP Fallout announced the PLEX for Good: Pakistan campaign. Running from 15 September to 6 October, the campaign will convert donations of PLEX, the 30-day in-game time cards that can be purchased with in-game currency. "Ladies and Gentlemen of the Listeners of EVE Radio - I am officially impressed with you. "Following a bit of 'pimpage' from my fellow EVE Radio DJs, tonight I ran my PLEX drive for the CCP PLEX for Good : Pakistan campaign, and I managed to pull in the sum total of 32,558,000,000 isk - 32.558 billion. "I have a number of contracted items to sort through and sell, but the current total of PLEX gathered for this campaign currently stands at 98 - that's $30 short of donating $1500 US - from a 3 hour show. "I will be selling the rest of the contracted items over the next couple of days, and plan to donate the PLEX to CCP's ingame character during next week. "Once again, many many thanks to all of you who have donated - this does in fact mean a great deal to me, and I am humbled before you all at your generosity and charitable spirit." For those Eve players wishing to contribute, the campaign for Pakistan continues until 6 October. But for those wishing to contribute and don't have enough cash to contribute a PLEX themselves, efforts like DJ Blacklight's give players with smaller wallets a chance to contribute. Another Saturday, another trip. No, its really not that frequent. And no, you can't have my ticket. I just wish I were flying in something cooler looking than an airbus. Maybe like a Jaguar. Hopefully I'll have more time in Bulgaria to enjoy myself this trip. And maybe get in a little blogging too. Fly safe! I fly out to Bulgaria again Saturday for a week of training on aspects of the software I use at work that I really haven't used before. With journeys of 12-14 hours each way (including layovers) facing me the next two weekends, I'll be indulging in my MMO gaming podcast addiction. So what am I downloading onto my iPod to pass the time? Channel Massive #138 - I love when the Channel Massive gang covers a blog-o-steria and I'm looking forward to listening to the latest one about the used game market. Van Hemlock #119 & #120 - I'm a bit behind in listening to Tim & Jon but episode 119 is a "what we're playing" show and episode 120 covers game publishers coming out with cheaper games and if mainstream television is ready for shows about videogames. Shut Up We're Talking #70 - I didn't see the show up at Virgin Worlds but I've downloaded it from iTunes. I always look forward to listening to Darren and Karen. WoW Insider - The folks over at WoW.com have a podcast that I rarely get a chance to listen to. All the travel will give me a chance to catch up. The Rift Podcast - I've only listened to the first 3 episodes and there are 11! Time to catch up. Notalotofnews Newshour - Recommended by Kirith Kodachi, I'm going to listen to episodes 14 and 15 as well as go back and listen to episode 1 about data cores. Plus, the hosts converted Clear Skies 2 into a video format for the iPod and put it up on iTunes. Guess what I'm watching! Lost in Eve - Another recommendation from Kirith, I've listened to episode 1 of season 2 and look forward to listening to the other shows of season 2. EQ2 Talk - And finally I've downloaded episodes 5 & 6 to catch up to a game I'm barely playing, EQ2. Not much going on with the patch today. And no update to the EQ2X cash shop or other F2P only news. Fixed a bug causing some zones to not be available for zoning. Fixed a bug were Experts and Masters of the previous tier could be automatically overwritten in your hotbar by an Apprentice spell. The Stonebrunt temporal pathfinder will now properly zone you into Sundered Frontier instead of leaving you high and dry in the middle of the sky. I don't play World of Warcraft a lot. It is the game I play when I don't want to think TOO much, but don't want to do something mind numbing like high-sec mining in Eve. So last night was an accomplishment when Rosilind, my hunter, reached level 20. Yes, it has taken me over 2 months to go from level 12 to level 20. I guess that makes me the definition of the term "casual". 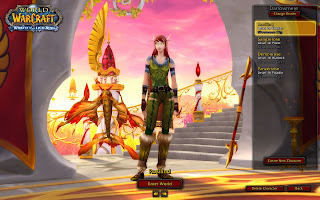 As part of my project of documenting what my characters look like as I level, here is a screenshot of my hunter. She doesn't look that much different than she did at level 12. But she is my character who is doing all of the scouting for the others. With all of the locked chests I've been running into lately, I'm thinking of creating a rogue. But no more blood elves. I'm thinking of creating an undead rogue. Cliche, I know, but with Cataclysm coming up, I'd like to see and play through some of the other Horde starting areas. This past week was the beginning of the American football season. Yesterday I spent three hours doing some high-sec mining in a Covetor while watching a game. I'm just wondering: am I the only one? And does watching sports lead to mining? If so, should we expect mineral prices to take another dive? Eve University gets wardec'd. The aggressor corp stays in their home system and doesn't give the student body a challenge. The leadership then decides to go after an old foe's assets inside a wormhole because revenge is a dish best served cold. Sound familiar? History repeated itself in July as the Eve University leadership used what appears to be a faildec by Black Water Mercenaries as cover for action against Adventures of the Gummi Bears. But this time, instead of capturing 2 POS, Unista fleets destroyed 18 Gummi Bears' POS. According to the Eve University killboards, the Unistas managed to destroy 9.6 billion isk in Gummi Bears ships and assets, including an Archon-class carrier. According to reports, the Gummi Bears could have avoided the losses by apologizing for wardec'ing the Uni. They refused. "Eve Uni never forgets our friends or our enemies. Gummy was unrepentant about their dec, their desire to kill newbies and pad their killboard. Eve Uni is unrepentant about kicking our enemies in the forks until they squeal for mercy. It doesn't matter how long it was since the crime they committed to earn their -10 standings from the Uni. If we find you in a place where we can hurt you, then we will. It as Keld so bluntly put it, a lesson for our students and for our enemies. Our students are learning about Wormhole and POS warfare as well as patience and our enemies are learning that the newbies have teeth and will fight back." The article from the Eve University School of Journalism was not published until 31 August, thus the delay in posting the news here. I guess I really need to start reading Silentbrick's blog. Sometimes what game designers lead players to believe a game to be is a lot different than reality. Take for example CCP. In their trailer for the Dominion expansion, they portray fleet commanders as calm, cool and professional. Reality can be, shall we say, a bit different. As an example today's Operation Smile post features two videos: the ideal vs. reality. The reality in this case being the famous supertwinkey69 vs. Dominion parody. How Boring Is Mining In Eve Online? Many capsuleers are probably wondering why we do not hear more reports like this. I stumbled across an interesting podcast this weekend. The Rift Podcast is put out by a couple of young ladies from Kansas (one via Brisbane, Australia) that is covering the new eagerly awaited MMORPG, Rift: Planes of Telara. I'm not exactly sure how they managed it, but the hosts managed to get access to the community manager and a bunch of the devs for interviews. They also have information on other Rift-related sites. So far I've only listened to two of the ten podcasts Arithion and Desikis have put together, but so far I'm enjoying them. I normally don't recommend listening to podcasts until I've listened to the first five, but I'd recommend listening to this podcast, or at least visiting the site, to anyone interested in checking out the game. The podcast is now available thru iTunes and I have added them to the podcast RSS feed on the blog. Before this last week, if anyone had mentioned propaganda in a video game, I would immediately think of Eve Online and some of the classic videos posted on YouTube by Goonswarm during their years long struggle with Band of Brothers. But then I found a paper published on Gamasutra titled "Towards An Interactive Goebbels: Can Propaganda Videogames Be Made More Effective And Is Resistance Futile?" Written by Brunel University Digital Games: Theory and Design masters student David McClur, the paper looks into propaganda, videogames and what the future could hold for the creation of propaganda videogames. Running 8 pages, I found a couple of conclusions worth posting. The first was a list of ways to make a propaganda video game more effective. Propaganda games should appeal to their desired audience in terms they can understand, believe and agree with. Widely known facts should not be ignored and arbitrary conditions should not be forced upon players, for fear that they will reject the work outright. Propaganda games should be made more enjoyable, and perhaps even addictive, so that they receive prolonged and repeated viewings. The potential of players emotional responses should not be ignored. Propaganda should be included subtly and made to appear to be a natural part of a game. Game mechanics, particularly rewards, penalties and ludic goals, should be used to drive players towards specific, desired behaviours. The way in which game mechanics are contextualised should be used to both express a position openly and to enhance any message they are designed to convey. Games should be designed to discourage oppositional readings. Wherever possible, propaganda messages should be encoded as an enthymeme in the gameplay itself, rather than as an additional message tacked on in the form of narrative. All possible elements of the game should be used to increase the likelihood of provoking the desired response in players. The second was why the future for propaganda video games is bright. Propaganda videogames have had some success already, with the release of America's Army. There is no requirement to be the first to risk capital investment in a test project. Propaganda is particularly difficult to detect in videogames. Videogames have a largely untapped potential to be extremely effective pieces of propaganda that players engage with for long periods and can even become addicted to. They require a limited investment of time and capital for a potentially infinite return of audience attention. Propaganda videogames are just as difficult to resist as other propaganda mediums. Videogames will potentially be legitimised as a factual medium in future, increasing public trust in them. Now, people who know me know I love a good conspiracy theory, and not just post's like Tipa's "A Parent's Guide to MMO Gaming", which I adored. So let me put on my tin-foil hat and carry the theory of propaganda video games to the next level. Quite frankly, does anyone take this seriously? Let's listen to the President of the United States, Barrack Obama. "Meanwhile, you're coming of age in a 24/7 media environment that bombards us with all kinds of content and exposes us to all kinds of arguments, some of which don't rank all that high on the truth meter. With iPods and iPads; Xboxes and PlayStations; information becomes a distraction, a diversion, a form of entertainment, rather than a tool of empowerment. All of this is not only putting new pressures on you; it is putting new pressures on our country and on our democracy." Now, I'm not going to discuss the fact that the Obama administration has brought the White House to YouTube or anything outside of video games. I'm also not going to get all defensive about video games like a certain Common Sense Gamer from north of the border did when this speech was delivered. I'm just going to stick to the subject of propaganda. "The tax portion of the problem is just one (or many depending how you look at it) of the design decisions that needs to be made in the production of the game. Yes, a good economic simulation would benefit the debate greatly. But who determines if the game is a good simulation or just a propaganda recruiting tool for one side or the other?" But was the commission looking at the game as a propaganda tool? I'm not sure. I'll leave you with this video from a California news station about how the Obama campaign in 2008 advertised in video games. Do you think that President Obama takes the possiblity of video games carrying messages seriously? I do, but then again, I'm wearing a tin-foil hat. In World of Warcraft, I think the only race in which I would play a female character over a male character is the blood elves. One reason admittedly is looks. I like the way the male models look for all races over the female models, except for blood elves. Blood elf females just look tougher than male blood elves. Maybe that is because they are! Exhibit A is this classic video by Percula showing an assassination attempt by a blood elf on an Alliance official in the heart of Stormwind. Classes can now be purchased individually off the Marketplace and through character creation. Armor crates have been added to the Marketplace selling sets of armor for all levels. You can now purchase Broker Credits from the marketplace! Broker Credits can be used for a one-time purchase or sell action on the broker for Bronze and Silver members. Selling and purchasing stacks of items count as a single broker credit so use them wisely! The XP bar will now stay put through relogging. The bonus xp from max level characters now displays properly at character select. Your UI settings should now be restored after using the /loadui command. The mini-map zone name will now display correctly after using /loadui. Fixed a bug where using /loadui while banking would keep you from using the banker until you zoned or logged out. Fixed a highlight bug on the city selection page of character create. Parts of the achievement interface and all of the paperdoll windows that were red will now be blue when loading the “Default Blue” skin. The background color of the paperdoll is now exposed to the UI files via the PaperdollBackgroundColor property. Fixed a bug causing coin to not be draggable to the coin section of the Character window. The Auto-Inventory area has returned. The main tabs were moved back to the top of the window, sub-tabs were moved to the bottom. Your character’s name was moved to the titlebar. The item of the week will display the item of the week description rather than a copy of the message of the day. The Sentinel’s Fate Daily Mission now appears on the Welcome screen. Adventurers looking to worship Anashti Sul and on the quest "Gathering Feathers" should now be able to locate the necessary scroll within Gorowyn's Grand Atheneum. Darklight Wood: You can now defeat ghoulish Nerian to update your quest. Feral Citizenry: Ghoulish Nerians should no longer remain in an “unattackable” state after being exposed to the Strobe of Innoruuk. The statue of Razorwing Steeldown within "Ascent of the Awakened" will now grant a replacement "Totem of Aaryonar" to anyone who has lost it and completed the quest "The Riddle of Razorwing." The "Totem of Aaryonar" is no longer removed upon completion of the quest "Feeding the Flames.” It is now removed upon completion of the quest "A Final Froglok Word." Troubadors who have completed the quest "An Ayonic Journey" can now read all of the pages within the book, "The Case of the Lost Lute." The wicked wand of malice has been altered. The effect attached to the wand is now an on equip effect. The 10% cast speed on hostile spells has been changed to a generic 10% cast speed mod attached to the item. Roehn Theer: Godslayer Breastplate rewards have been made more in line with the challenge. Shroud of the Faithful is now claimable one per character. Fixed a rendering issue with Dendroxa the Envenomed. Stigmatic Frenzy now correctly triggers on the caster's group. Damage Reflection abilities can no longer do more than 300% of the max health of the caster before Crit Bonus and Potency. Chilling Invigoration is now correctly modified by the Inquisitor's stances. Stonebrunt Highlands: NPC Combatants found outside of Quel’ule should no longer fly up into the sky. Drop rate of the "Ornate Winged Eye" has been increased and should now drop even if mobs are grey. There should now be a new respawn area in the beginning section once the first two groups of Zeklings have been defeated, thus keeping the circle of death from occurring. Kastus & Odaufe should no longer one shot players with their respective frostbite damage shields. It is still recommended players not hit them with the wrong damage type however as they can still easily kill players with them. Kastus & Odaufe should no longer regain their damage shields if not killed quickly enough after being hit with the ice axe. Mosaasus now has a smaller hitbox area. Players now have more time to get to the platforms to prevent his adds from coming to life. Zone-in issue has been fixed.